César Antonovich Cui (born January 18 [January 6, O.S. ], 1835, Vilna (now Vilnius), Lithuania, Russian Empire – died March 13, 1918, Petrograd (St. Petersburg), Russia)), a famous Russian composer of operas, songs, and piano music, an expert on fortifications, music critic, one of the members belonging to a famous nationalist group of Russian composers The Five (The Mighty Handful; Moguchaya Kuchka). He wrote 14 operas, including 4 children’s operas, a great amount of music; several hundred songs, many piano pieces and chamber works, numerous choruses, including 3 string quartets, several orchestral works, and many choral works. César Cui was born on January 18, 1835 to a Roman Catholic family in Vilnius, Russian Empire (now a part of modern-day Lithuania). He was the son of a French officer, Antoine (Anton Leonardovich) Cui, taken prisoner during Napoleon’s campaign of 1812, who remained in Russia after the war, married a Lithuanian noblewoman (Julia Gucewicz), and settled as a teacher of French in Vilnius. The family had five children of which César was the youngest. He received piano lessons and instruction in music theory as a child. César grew up learning four languages – French, Polish, Russian and Lithuanian. Cui began to compose while he was still a boy, imitating the style of Frédéric Chopin. In 1849 the Polish composer Stanislaw Moniuszko came to town to stay for a while, Cesar had some sort of theoretical training with him. 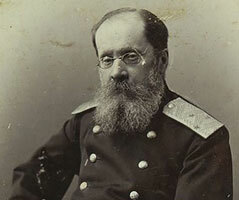 In 1850 he went to St. Petersburg, where he entered the Engineering School in 1851 and later the Academy of Military Engineering (1855) and began a military career. Cui served the military in 1857 as an instructor in fortifications. César was quite successful in the military, among his students were members of the Imperial family, particularly, the renowned, Nicolas II. 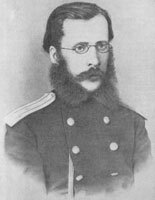 In 1857, Cui met Mily Balakirev, who helped him master the technique of composition. Cui became more seriously involved with music, becoming a member of what would eventually be constituted and known as The Five (The Mighty Handful; Moguchaya Kuchka). 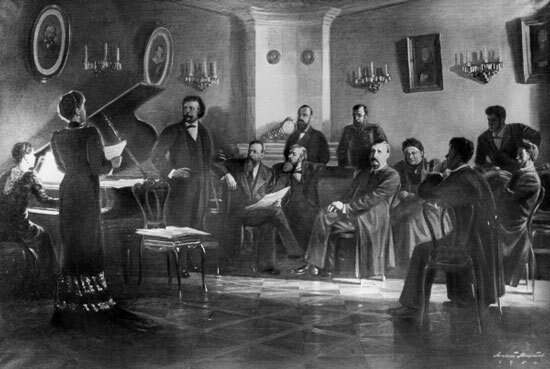 Nikolai Rimsky-Korsakov, Modest Mussorgsky, Alexander Borodin, Mily Balakirev and César Cui banded together in an attempt to create a truly national school of Russian music. Though Cui composed only in his spare time, he was surprisingly prolific and produced a wide body of work that spanned all the major genres except the symphony and symphonic poem. In 1858 he married Malvina Rafailovna Bamberg, one of Dargomyzhsky’s pupils, whom he met at Alexander Dargomyzhsky’s house where Malvina was taking musical lessons. Cui dedicated to her his first numbered opus, a Scherzo for piano four hands on the theme BABEG (for the letters in her name) and CC (his own initials). Malvina Bamberg and César Cui had two children Lidiya and Aleksandr. Lidiya became an amateur singer, and Aleksandr became a member of the Russian Senate. In 1961–1968 Cui was working on his opera William Ratcliff, based on the tragedy by Heinrich Heine, on 14 February 1869 [Old Style] was the first public performance of an opera, but it had no success. The reason to this could be stated as the harshness of his writings about music in the media. Nevertheless, this opera has considerable significance in the history of Russian art music, not only for the fact that it was the first opera by a member of The Five to reach the stage, but also for musical features that suggest experimentation and interrelationships among The Five. The same thing happened to Angelo (1871-1875), based on Victor Hugo’s prose play. Angelo was premiered on 1 February 1876, but it did not survive that particular season, and was removed from the repertory. Cui began writing music criticism in the St. Petersburg News (St. Petersburg Vedomosti) in 1864 and later in various newspapers and journals, continuing through about 1900, up to 1918, Cui wrote almost 800 articles for numerous newspapers and other publications, across both Russia and Europe. His critique style was very often negative and sarcastic, which didn’t always produce a good result for Cui. He was also a member of the Belyayev circle (a society of musicians in Russia whose members included Nikolai Rimsky-Korsakov, Alexander Glazunov and Anatoly Lyadov). 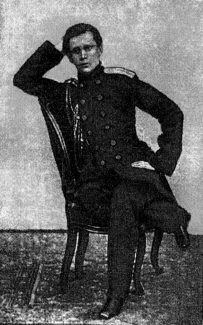 During 1896 – 1904, César Cui was the director of the Russian Musical Society, St. Petersburg Branch. In 1906, he attained the rank of general, and his textbooks on fortifications were widely used. César Antonovich Cui was a very prolific composer. Composer’s legacy includes 14 operas, among them are The Mandarin’s Son (Syn mandarina; 1859), William Ratcliff (1869), Angelo (1875), The Saracen (1898), The Captain’s Daughter (Kapitanskaya dochka; 1909), including 4 children’s operas The Snow Bogatyr (1904), Little Red Riding Hood (1911), Puss in Boots (1912), Ivan the Fool (1913), and several ‘adult’ one-act operas. Cui composed a great amount of music, he wrote several hundred songs, many piano pieces and chamber works, numerous choruses, including 3 string quartets, several orchestral works, and many choral works. Cui made the first completed version of Musorgsky’s The Fair at Sorochyntsi (Sorochinskaya yarmarka; 1917). The composer went completely blind in the year 1916, after which he composed his works through dictation. César Cui died on March 13, 1918.